Ah, the legend of an afternoon nap. We’ve all been there, especially when a previous evening’s activities catch up with us while we’re at work trying to focus on getting things done. Updated below with comment from the pillow designer. Past attempts at grabbing some shut eye from your desk were fraught with issues — mainly around comfort — but there is a proposed solution, and it comes in the shape of the Ostrich pillow. It is neither a pillow nor a cushion, nor a bed, nor a garment, but a bit of each at the same time. Its soothing cave-like interior shelters and isolates our head and hands (mind, senses and body) for a few minutes, without needing to leave our desk. 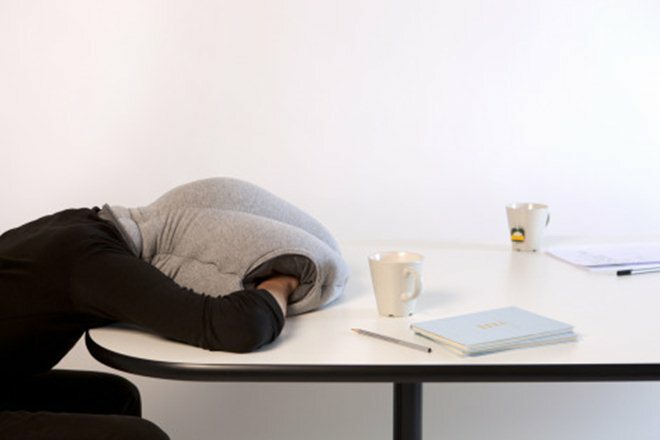 Unfortunately, there’s bad news, the pillow is not currently available for purchase. I’d certainly welcome an all-guns-blazing campaign to raise awareness of the product, but perhaps we can start by dropping a note to encourage the designed to put this product into commercial existence – a contact form can be found on its website. The Madrid and Lausanne-based organisation is quite the innovator, and its other projects include a twisted toothbrush, toilet-seat inspired chair and speaker wall. 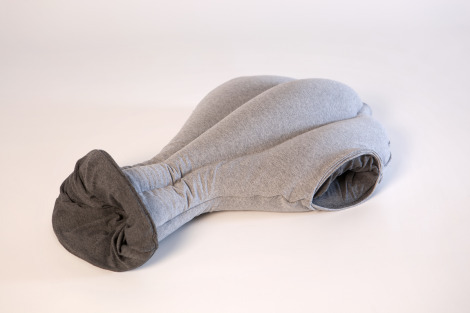 For the moment Ostrich Pillow is not yet in production, we are still in conversations with a manufacturer.